Over the recent years, high temperature insulation market has been witnessing robust growth prospects owing to the extensive usage of insulating materials in safeguarding, preserving, and enhancing the longevity of industrial machinery and equipment. Insulating materials, of late, have found an increased prominence in a plethora of industries such as petrochemical, iron and steel, aluminum, glass, ceramics, and cement among others, which has had a tremendous impact on the global high temperature insulation industry share. Concurrently, it would be prudent to mention that the growing inclination toward energy conservation across diverse business spheres has contributed substantially to the rapid expansion of high temperature insulation market size. Furthermore, in a bid to reinforce efficiency and revamp the existing product spectrum, the leading industry players have increasingly focused on unveiling a range of upgraded and advanced products. Morgan Thermal Ceramics for instance, has launched a range of thermal insulation products for HVAC, water heaters, boilers, and boiler flues. In addition, the UK based high temperature insulation industry giant has unveiled a first of its kind flexible blanket, named as FireMaster® FastWrap® XL, composed of advanced fibers which are said to withstand a temperature of 1200 degree Celsius. 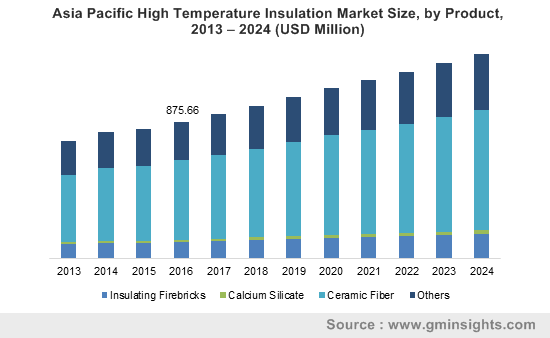 Apparently, the aforementioned initiatives and the likes by the market giants are slated to carve a lucrative path for the high temperature insulation market over the estimated time frame. Elaborating further on the applications of FireMaster® FastWrap® XL, the product comes fully enclosed in durable glass fiber which makes it easy to handle and install. To add to it, the product is classified by Underwriters Laboratories Inc. which equips it with a host of innovative protection features such as fire resistive enclosure protection, electrical circuit safeguard, and reduced clearance for exhaust outlets. Apparently, the trend of launching such ingenious product innovations is bound to encourage other industry giants to come up with upgraded versions of the existing insulation products. As a consequence, this would vigorously impel the growth potential of high temperature insulation market size, which was estimated to have held a total valuation in excess of USD 3 billion in 2016. Meanwhile, the product spectrum of high temperature insulation industry, of late, has been dominated by ceramic fibers which reportedly accounted for over USD 1.7 billion of the overall market share in 2016. It would be prudent to mention that the ceramic fibers have found a wide range of application in diverse end-use businesses owing to their low thermal conductivity, low density, and reduced thermal inertia which aids them to save energy and control the temperature in the insulating surface. Given such wide application portfolio, it is quite evident from that this product segment is anticipated to lead the high temperature insulation market landscape over the forecast time span. Furthermore, the consistent efforts being made by research scholars across various universities and research labs has provided a renewed boost to the product penetration in diverse business verticals, which has augmented the swift expansion of high temperature insulation market share across the globe. As per some recent news reports, researchers at Brown University in collaboration with subject experts of Tsinghua University have developed a sponge-like material, extracted from ceramic nanofibers, which is said to possess unique properties such as enhanced heat resistance retention capability and improved flexibility. Furthermore, the material has demonstrated an excellent ability for high temperature insulation which would make it one of the most appropriate materials that could be utilized in high temperature applications. Concurrently, the surging demand for ceramic fibers from industrial thermal insulation market, owing to the fact that it offers an extended operating life to industrial equipment and also ensures energy compliance, is likely to favorably impact the high temperature insulation industry progression in the ensuing years. A research report compiled by Global Market Insights, Inc. claims worldwide high temperature insulation market to exceed a total revenue collection of USD 4 billion by 2024.